6 Reasons Thanksgiving is the BEST! In honor of this holiday, here are my top six things that are awesome about Thanksgiving. The official beginning of eggnog season. Which means it’s the beginning of eggnog cocktails, which as everyone knows, are acceptable to drink at any time of the day but taste best in the AM. The use of the pumpkin and squash in everything. I love butternut squash soup, pumpkin ravioli, baked squash with some maple syrup, and of course… Pumpkin pie!!! Grandpa’s stuffing. I’ve written a whole post about this, so I won’t go in to details here. Suffice it to say that this is, hands down, the best stuffing recipe you’ll ever see. I look forward to eating this this starting the minute my leftovers are gone the previous year. Turkey preparations. I LOVE hearing about how different people make their birds. Whether you fry it, bake it, de-bone an roll it, wrap it in bacon, or smoke it, your preparation is always the best. And last but not least… Leftovers. From which turkey hash, turkey sandwiches, turkey omelets, turkey tetrazzini are born. What are some of the things that you love about Thanksgiving? Is there something that you can think of that without it, it’s just not Thanksgiving? Turkey wrapped in bacon? You can DO that? I would add: Leaving my aunt’s house with a big ziplock bag filled with leftover stuffing every year. All due respect to your Grandpa, her stuffing rules all mankind. You can wrap bacon around anything! also… I think I smell a stuffing throwdown coming on! This post (and associated comments) has inspired me to reinvent bacon-wrapped stuffing. Look at that, only a few days in and you’re already INSPIRING people! Glad to hear it! Speaking of divine goodness that is bacon, did you see this brine? I’m tempted to try it for Thursday. if I do, I’ll report back with clogged arteries. 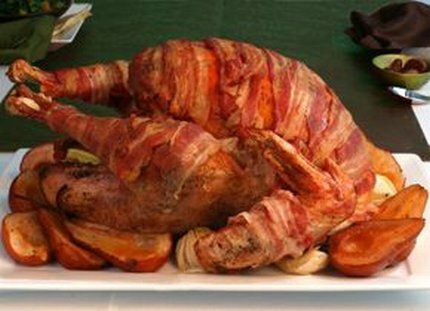 Wow – I’ve never seen a bacon-wrapped turkey before – does it work?? We made some great use of butternut squash this year – pureed with some brown sugar and nutmeg and butter. It hit the spot! It definitely works. I did it a few years back with panchetta instead of bacon. It makes the skin nice and crispy.